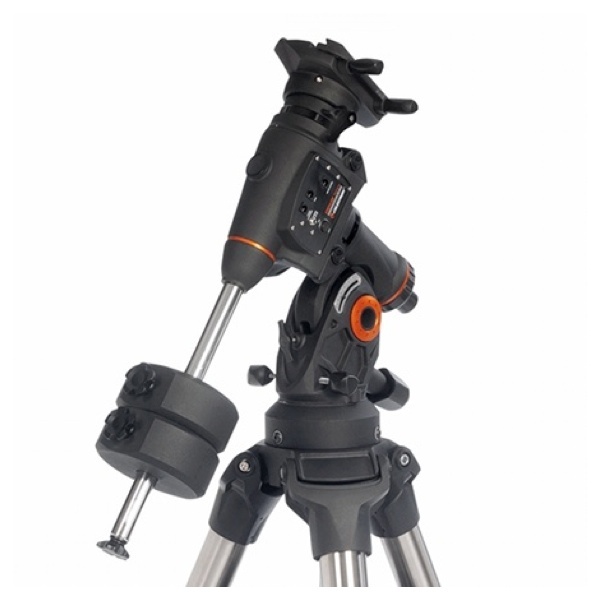 The CGEM DX™ mount is the newest member of our fully computerized Equatorial mount series capable of carrying Celestron’s high-end 11" and 14" optical tubes. The CGE PRO style, 2.75" leg tripod holds even the our 14" optics securely while dampening vibration, which is ideal for both imaging and visual observing. Capable of holding 50 lbs of payload and slewing at 5° per second, you will be able to instantly point to any of the celestial objects in the database. CGEM DX was designed to be ergonomically friendly with large Altitude and Azimuth adjustment knobs for quick and easy polar alignment adjustment. The internal RA and DEC motor wiring provides a clean look and an easy and trouble free set up. The CGEM DX series has a new innovative Polar alignment procedure called All-Star™. All-Star allows users to choose any bright star, while the software calculates and assists with polar alignment. Another great feature of the CGEM DX sure to please astroimagers, is the Permanent Periodic Error Correction (PEC) which will allow users to train out the worm gears periodic errors, while the mount retains the PEC recordings. For objects near the Meridian (imaginary line passing from North to South), the CGEM DX will track well past the Meridian for uninterrupted imaging through the most ideal part of the sky. The CGEM DX mount has a robust database with over 40,000 objects, 100 user defined programmable objects and enhanced information on over 200 objects. Redesigned electronics deliver constant regulated power to the motors making them capable of driving the telescope even when not perfectly balanced. This allows the CGEM DX to have the payload capacity of that of much larger mounts without sacrificing smooth tracking motion and pointing accuracy across the entire sky.